Elvis 6 can be tightly integrated with Enterprise Server 10 to use Elvis as a storage location for files that are used in the Enterprise workflow. Note: For information about how this integration works, see Integrating Elvis 6 in Enterprise Server 10. This article describes the installation and configuration steps for integrating Elvis 6 in Enterprise Server 10.5 and higher. 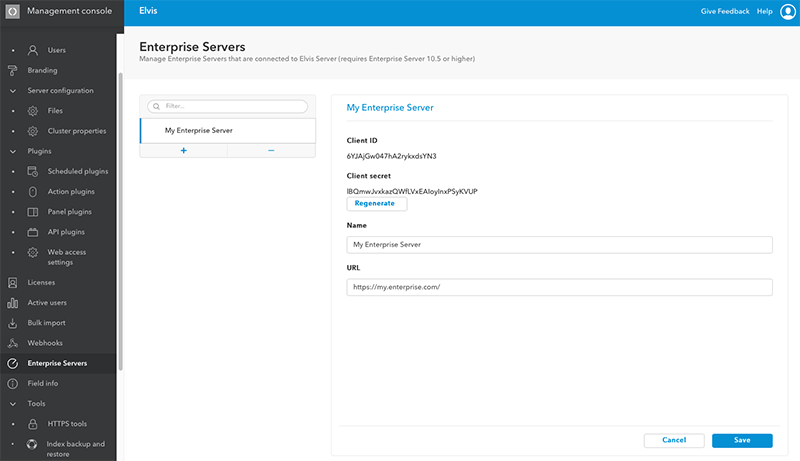 Steps for earlier versions of Enterprise Server can be found in Integrating Elvis 6 in Enterprise Server 10.0 – 10.4. Instructions for upgrading an existing integration can be found in: Upgrading integrations of Elvis 6 and Enterprise Server 10. The integration is done through plug-ins. Connecting Elvis with Enterprise Server is done through the Elvis Content Source plug-in for Enterprise Server. In Enterprise Server 10.5 and higher this plug-in is shipped as part of Enterprise Server. No installation steps are therefore required for Enterprise Server. Step 1. In Elvis, access the Management Console. Step 2. In the menu on the left, choose Enterprise Servers. Step 3. Add the Enterprise Server instance to connect to. Note: (For Elvis 6.24 or higher) After entering the URL, Elvis tries to connect to Enterprise Server. To prevent CORS related issues it may be required to add the Elvis domain as an origin to the CROSS_ORIGIN_HEADERS setting in the configserver.php file of Enterprise Server. When saving the settings for the server, a client ID and client secret is automatically generated and displayed. Keep the page open, the client ID and secret are needed in the next steps. Note: The client secret is only shown once, straight after adding the Enterprise Server instance. When next viewing the settings for that server, the client secret is hidden and needs to be regenerated. When the previously generated client secret was already used in the configuration file (see below), this needs to be udpated. 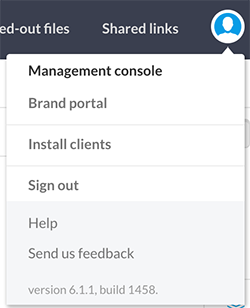 Tip: Copy the ELVIS_CLIENT_ID and ELVIS_CLIENT_SECRET from the Enterprise Servers page in the Management Console (see above). Simply click the value once to copy it to the clipboard. When an Enterprise user makes a change to an asset (such as updating its metadata, opening it in an external editor, or deleting it), the user who made these changes needs to be communicated to the Elvis users. When the acting Enterprise user is known to Elvis, the name of that user will be used as the actor who applied the changes to the Elvis assets. When the user is unknown to Elvis, a default user is taken instead. This default user must be defined. Step 2. Configure the option ELVIS_DEFAULT_USER. Whenever an asset is updated in Elvis (such as updating its metadata, opening it in an external editor, or deleting it), Enterprise users need to be made aware of this. Once an asset update is received it is applied directly to the corresponding Enterprise shadow object. For MacOS and Linux: cURL is pre-installed on these systems, no installation steps are necessary. maxexectime. The maximum amount of time that the script runs in seconds. The value should be between 60 and 600 seconds (1 and 10 minutes) and should match the schedule interval. Default value is 600.
maxtimeoutperrun. The maximum timeout in seconds for each update call to the Elvis Server. It should not be higher than the 'maxexectime' value. Default value is 15 (it should be between 5 and 20). The scheduling can be done by using Cron (Linux / MacOS) or the Task Scheduler (Windows). */5 * * * * curl "http://localhost/enterprise/server/plugins/Elvis/sync.php?maxexectime=300&maxtimeoutperrun=20"
An admin user is required for the data synchronization between Elvis and Enterprise. During production, this is done by Crontab or Scheduler which continuously runs the sync.php module. For each run, this module logs in to Enterprise using the configured admin user. Note: In this process, the default user (ELVIS_DEFAULT_USER) is used to retrieve data from Elvis, while the admin user (ELVIS_ENT_ADMIN_USER) is used to update data in Enterprise. Step 2. Define the options ELVIS_ENT_ADMIN_USER and ELVIS_ENT_ADMIN_PASS. A copy of the original file in Elvis is added to Enterprise. It is not linked to the file in Elvis. A shadow object of the original file in Elvis is added to Enterprise. It is linked to the file in Elvis. A copy is made of the original file in Elvis and stored in the Production Zone. A Production shadow object is added to Enterprise. It is linked to the file in the Production Zone. An image added to Enterprise is stored in the Production Zone in Elvis. A Production shadow object is added to Enterprise. It is linked to the image in the Production Zone. How to configure this aspect of the integration depends on which methods you want to use. For a detailed explanation, see Controlling how files are stored in the Elvis 6 - Enterprise 10 integration. To see and use the panel, users need to be granted access. Do this by enabling the Permission named 'Used In' for a user or user group. For more information, see Controlling user access to folders and assets in Elvis 6. The installed Elvis Content Source plug-in needs to be activated in Enterprise Server. The plug-is listed with the name 'Elvis'. It is deactivated by default. Click its icon to activate it. The icon should change from red to green. Figure: The Elvis plug-in activated on the Server Plug-ins page. 11 March 2019: Updated the values of 'maxtimeoutperrun' in the examples to 20. 25 February 2019: Renamed section '5. Defining how Elvis assets are used in Enterprise' to 'Defining how files are stored in Elvis and Enterprise'.